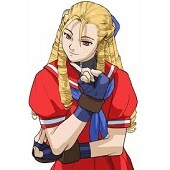 Juni is a rather obscure character in the Street Fighter universe as she appears to be playable only in Street Fighter Alpha 3 (I think). As a Shadolaw doll, we unfortunately don’t really know much about her. Her special move are almost similar to Cammy. 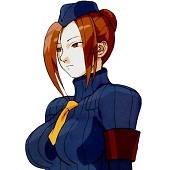 This character appears again in the Intro and the Ending of Cammy in Super Street Fighter IV. I like this character (In general, I like obscure character, lol) and I hope we’ll see her again as a playable character in the future with, this time, a more developed background. I tried to make her appearing more joyful as what she’s in SFA3 (due to her brainwash I think). To draw this picture I uses Gimp 2.6 to do all the work (sketch, line art, coloring…) and a tablet Wacom Intuos 4 M.